This starts off as a chemically induced orange that became a little too cloying for me. I am a fan of the original Pink Sugar and although that one is also synthetic, it was heavily obscured by the caramel and vanilla. Gold Sugar is a victim to what is usually common amongst cheap citrus based fragrances; it smells a little like Lysol. The effect is not immediately noticeable; in fact I had to really look for it (I’m so picky!). 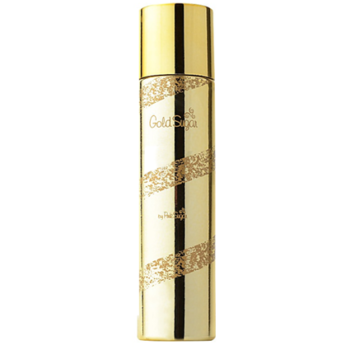 Gold sugar is still a decent fragrance, and for the price this is worth a second glance. I bought this flanker based on the notes; I mean crème brulee is my favorite dessert so how could I pass? GS smells like delicious cream and egg tart, the coconut sets a tropical tone that feels a little beachy. The main components are pretty simple; it’s basically custard, cream, and coconut with a tart base. It’s linear and can become a little boring. I don’t dislike Gold Sugar, it’s just generic gourmand. If you’re interested in something basic and nice, I think this fragrance might temporarily fulfill your cravings. Going by appearances Pink Sugar looks sadly garish with that weird metallic string thing that looks like a thong wrapped against a tacky frosted bottle. On the surface it seems rather tawdry, but this fragrance is absolutely anything but low quality. I personally would have never purchased this if it weren’t for a tester at Nordstrom’s. Pink Sugar veers into familiar territory with its basic candy notes and warm vanilla, but what separates this fragrance from other generic perfumes is that it doesn’t try to be anything other than itself. This isn’t a complex and expensive scent; it’s incredibly safe but also very fun, girly and uncomplicated. I can definitely smell cotton candy as the primary note; it’s rather linear and doesn’t change very much. Caramel and vanilla are warm and syrupy; it feels like I am being wrapped in a yummy pink cloud! PS eventually phases into a cozy sweet scent that is almost cloying, I am reminded of warm toasted marshmallows and strawberry flavored lipstick. There’s a heavy synthetic/chemical smell on the dry down but it’s quickly overshadowed by a musky powder, thankfully the result feels more womanly than girly. Longevity is spectacular on me, and sillage is just right. Pink Sugar has found a niche in my morning rituals; I just adore it so much. This is something I can wear daily and in any condition; it’s inoffensive and frilly, surprisingly suitable for all ages and doesn’t settle into something too immature. For the price, quality, and longevity this is a wonderful and simple addition to my wardrobe. The queen of white florals in my opinion, it’s very clean, soapy, and elegant; J’adore happens to be the one fragrance in which my husband has constantly praised as “the pretty one”, in light of the fact that he is absolutely finicky about perfumes in general. Therefore I own many variations of this scent in abundance; when it comes to J’adore I would recommend buying the EDP because the sillage and longevity are quite extraordinary. Despite its popularity, this is a very generic fragrance. There was no love affair for me, no deep infatuation; in fact our relationship seems to be quite proper and amiable thank you. I wear this to please others; when I am quite tired of being agreeable and just let my body roam about at parties, dragging along like a sack of meal. This is the “safe” scent, the “can I please go home and fling my bra across the room” fragrance. It’s forever genteel, and I’ve so often find myself becoming quite bored with its monotony. A reviewer said this smells like a Stepford Wives perfume and I completely agree, it’s trophy wife in a bottle. Either way this is my favorite jasmine, but it’s not a complete jasmine as pear and melon notes are quite evident in the opening. Lily of the valley and peaches are mellowed in the background as roses and magnolia blossom into being, citrus notes are subtle but it keeps this scent very clean and fresh in the dry down. This is an almost tropical fragrance, it reminds me of Hawaii during the spring; all that is lacking is a little coconut and benzoin to give this a beachy vibe. Overall not a love, but still a beautiful scent meant to be a crowd pleaser. I feel J’adore would be the perfect gift for someone unfamiliar with perfumes in general, and are looking for something appropriate for all occasions. It’s a safe blind buy with strong sillage and longevity (if your version is the EDP) and is quite beautiful despite its rather bland and linear personality. I must admit, this is my favorite patchouli fragrance ever. It’s most impressive because I usually dislike strong honey notes, but this scent is refreshingly bold and complex. 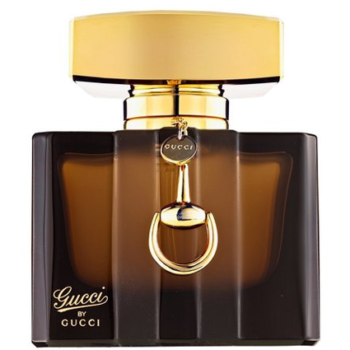 Gucci Gucci is certainly not mainstream and that in itself is a plus– there is a dark sense of refinement about this fragrance– I feel like I am transported through time and finding myself on a date with the Great Gatsby himself. It feels very much like a vintage piece but the tropical notes suggests a modern flair. I tended to hate patchouli as a main component in most perfumes, as it tends to give a very dirty earthy vibe which reminds me too much of wet foliage for some reason. Even when blended with fruits or florals, it’s easy to become completely overwhelmed by the herbal-ness quality that I’ve often find myself a little queasy. This is not the case with Gucci, as that “wet plant” quality seems to have been noticeably curbed, the patch here feels lush and opulent. It maintains a dark and boozy personality throughout; while the honey adds to the warmth of this fragrance, the patchouli stays cold and mysterious. Guava and pear top notes are subtle and are quietly overshadowed by the tiare flower which gives this fragrance a very tropical floral accord. Sillage and longevity are very good on me and I absolutely love the dry down, it smells like wealth, power, and seduction…this is confidence in a bottle. Gucci feels very mature to me, and I don’t mean age…I mean sophistication, class, and elegance. It’s beautiful but I can’t imagine everyone loving it the same. I maintain that certain fragrances will choose its wearer and not the other way around; this is unfortunately the case with Gucci. If you can find a love for refined patchouli and honey, this is a great and nostalgic adventure. Worthy of a test but not a safe blind purchase. 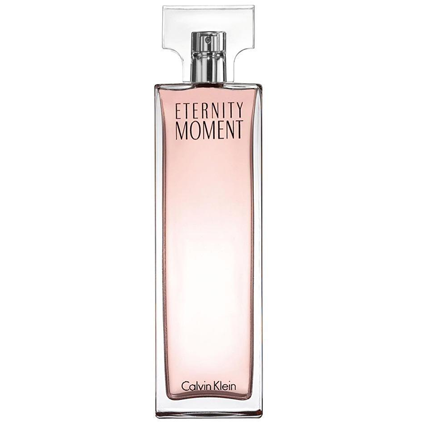 This fragrance is absolutely lovely; simple and clean yet never boring or dull. Pure reminds me of country linen and white floral bouquets, it’s beautiful and understated. The sandalwood tones are my favorite, so light and airy- makes me feel meditative and peaceful when I catch whiffs of it throughout the day. Pure is minimalistic (sillage is very light and personal), and the bottle accurately reflects this wholesome nature. I get moments of clarity when wearing this; soft vanilla undertones feel so graceful and serene! Lotus notes are beautifully formulated along with a very creamy jasmine; this opens up to a powdery floral with soft amber that invokes feelings of warmth- like sunshine on white petals. My favorite part is the advent of sandalwood to this gorgeous dry down, it is so smooth and so tempered that I can totally imagine myself in a Buddhist temple with doors and windows wide open, allowing the tepid breeze and hints of incense to overcome me. Just when I thought it couldn’t get any better, the freesia sneaks in and elevates this fragrance into white floral heaven. Pure feels absolutely ageless- because life after all is about the journey, and this perfume has the capacity to bring patience and appreciation to my otherwise hectic existence. This is a wonderful example of simplicity without compromise, and is as close to my definition of aromatherapy as one can get. Pure is easily coveted among my top ten favorite vanillas and an extremely safe blind buy. A part of me regrets the day that I first laid eyes on Initial L’Eau; I was going through some difficult circumstances and was eagerly anticipating the experience of something new and exciting. To top it off I was enduring the final throes of a virus infection, so my mind wasn’t completely prepared for some of the more fastidious notes in this composition. This is a beautiful fragrance, I predicted it to smell exactly like how the bottle appears, and it does! This feels very vintage, feminine, and sensual in a pure and wholesome way. My only complaint is that the citrus notes are a bit overpowering; the initial spray was a blast of bergamot, iris and tonka bean. Then the vanilla and neroli pulls through and becomes the primary structure in which the grapefruit and orange notes build upon. Overall it’s a harmonious blend of fruits and florals, with just a tad of bitterness to capture your attention. Unlike other reviewers, I find the sillage to be pretty strong. 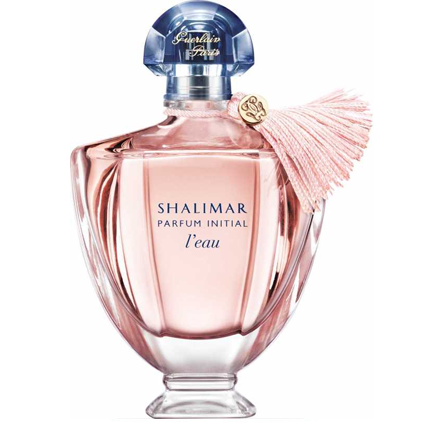 At first I thought the merging of powder and citrus to be such a strange combination but it works well together in L’Eau; you will feel as though you’ve been wrapped within pink clouds and bright sunlight. The dry down is very clean and optimistic; vanilla soothes much of the starkness and gives this fragrance a very delicate, feminine personality. I see now that I haven’t fully realized my appreciation for Initial L’Eau, due to my having attached this fragrance with some bad memories. Unfortunately that is part of the journey with all fragrances; I’m hoping that I can one day revisit this unique perfume with perhaps a better frame of mind. I really tried to love L’heure Bleue, but somehow I can’t. There is something very animalic about this fragrance that reminds me of “skin” and play-doh; I love powdery scents but this one feels multifarious in nature. Let’s start with expectations; everyone hails L’heure Bleue (or “the bluish hour”) to be a dualistic perfume, vital and important for its era. 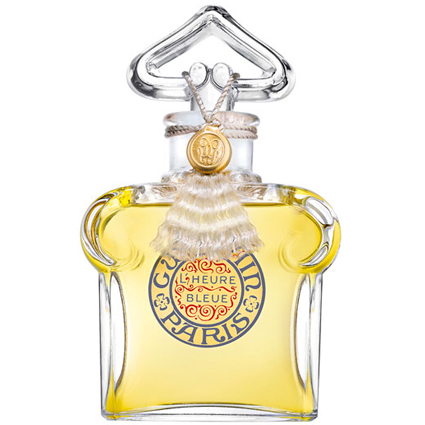 A hallmark to its kind, words such as sadness, loneliness, weariness and even hopefulness were used to describe this Guerlain creation. I am a huge fan of this house and all of their innovations, but this is the only one which I’ve never understood, perhaps the issue is me; perhaps my nose isn’t refined enough…or that maybe I’ve lacked imagination. Either way, Bleue failed to extricate the feelings of despair and tragedy that I anticipated (for that I convey my desires to Mitsouko, the sibling to L’Heure Bleue). Bleue smells like a romantic night, it’s intimate and slightly vulnerable, like a whispered secret between two lovers. The scent is mysteriously carnal and smells of desire; I get the slight impression of seeing myself buried within a woman’s warm powdered bosom. There are lots of irises in the opening, along with a musky carnation. Vanilla is very apparent throughout its life, but no doubt it is in accordance with the heliotrope that creates this very unpleasant doughy fragrance that makes me sick to my stomach. I’m not sure why but the Benzoin and cloves add on a very medicinal texture that also makes this rather unpleasant. I sense very little rose and citrus, ylang-ylang and tonka bean become a little more apparent in the dry down. Even though I cannot truly appreciate the extent of its brilliance, that doesn’t mean I can’t appreciate its innovation. This is a high class fragrance, though wrought with unpleasantness (to me), I can easily see why this became such a masterpiece. Longevity is pretty good, though this quickly becomes a skin scent after an hour. Either way this is not a safe blind buy; but considering that Bleue is slowly disappearing off the market, it might be worth it to purchase anyway. I have come to the conclusion that men’s fragrances can be much more complex and pleasing to the palate than the average woman’s winter lineup. 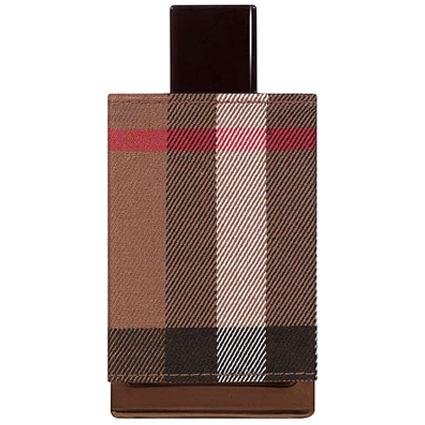 My latest excursion with Burberry London has proven that perfumes are multifarious in nature, genderless and will appeal to practically anyone who can wear it with love and confidence. This is the perfect fall companion, much like a trench coat on a brisk Autumn day. London opens up with strong cinnamon and tobacco notes; there is leather at the base and mild citrus to keep this feeling fresh. The bed of oak moss is what gives this perfume a very damp earthy scent that rounds out all the other notes. It smells like wet soil mixed with fresh lavender after a heavy rain. The cinnamon stays true through dry down along with a very surprising scent of roses, the tobacco is still there but it’s become softer and more sentimental. To me this is Thanksgiving in a bottle: warm, spicy, and reminds me of my grandfather’s library. I’m surprised mint was not listed as an ingredient on this; there certainly seems to be some kind of bitterness accompanying the rose and fig opening of this fragrance. 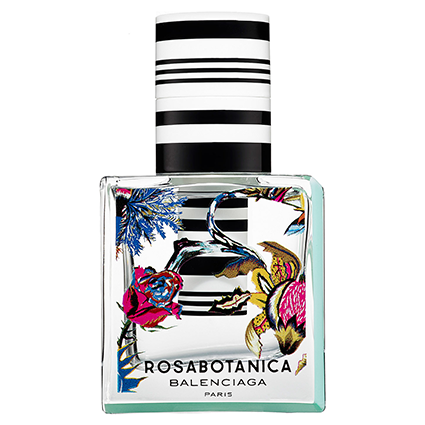 Rosabotanica is a very green scent, I feel like I am standing in the middle of an English garden after a heavy spring shower, basking in the aroma of fresh flowers and wet grass. The dry down consists of cardamom, woods, and a very sheer rose. There is pepper throughout its life but I also sense a little saffron as well; grapefruit balances everything out to make this a very clean and energetic fragrance. 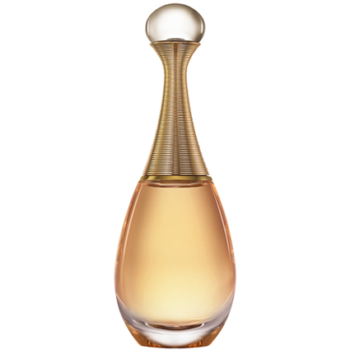 Rosabotanica isn’t particularly innovative; it’s a streamlined fragrance with a little twist. There’s something here that reminds me of Agent Provocateur, the rose is an Indian rose…not your conventional evening flower. I am absolutely in love with the dry down after about an hour, pink pepper balances so well with the florals that it’s a shame how soft the sillage is. It’s certainly a skin scent, with almost no projection and poor longevity. Overall not exactly a game changer, but still very memorable and the bottle design is pretty enough to make it almost worthwhile.